Does Potomac Seniors Village (1) LLC, Inc offer the following services? Potomac Seniors Village is designed to empower the elderly to maintain and enhance their lifestyle with a simple wellness philosophy: compassionate and personalized care, a healthy living environment, and supportive services. Our talent is not flamboyant, it is simple and personal. It lies within the footprint of our 7 acres of lush green landscape; it is focused on our warm home-like environment; it is surrounded by affection, love, and care. It is simple, our assisted living is a home not an institution. Here, a resident is not a number and a senior is not a case management. Potomac Seniors Village is a gracious assisted living community, nestled in a tranquil setting amidst the shadows of pine, maple, and cedar trees of Potomac neighborhood. We are 15 minutes from Norther Virigna, Bethesda, Rockville, and 20 minutes from our nation's capital. We offer unique concept where our residents can cherish a home-like enivornment unmatched by any institutionalized type environment. 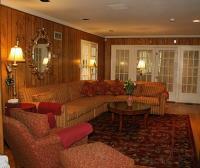 our ambiance and setting is of a home - giving residents a sense of belonging and personalized service.